333Palace is a new, but popular casino, which was founded in 2014 by Colosseum Entertainment Ltd. This online casino is extremely popular among French players. Entry is restricted to the US players, but barring that players from most other countries can take part in this casino. A unique aspect of this online casino is its simplicity. Although it is loaded with over 300 games, as a player you won’t get lost among the plethora of games that are on offer. Some of the other features that has made 333Palace quite popular in a short time are the great promotions that they offer their players, a sleek website, wide range of paying options and high rewards! Most of these games have two levels that vary with the amount. The most exciting games, however, are the ones with the progressive jackpots. Within only a year of its establishment, this online casino has already seen some very big wins by players across the globe. Being a new player in the online casino industry, you are entitled to receive a 100% bonus amount on your first deposit. The bonus amount is valid up to a deposit amount of $333. Along with this, you will also find rewards in the form of live dealer prizes, loyalty programs and various slot tournaments. Some other incredible offers include free spins on the launch of a new slot and surprise bonuses! This is one of the few gaming platforms, which has a top-notch mobile platform. It supports all the latest devices such as iPad, Android, iOS, Blackberry and the like. Although you will find only a limited number of games, 18 to be more precise on the mobile platform, the games’ quality more than make up for the few games available. You are eligible to win a cash prize of 500 if you sign up on the mobile platform. When people deal with money online, everyone’s a bit hesitant, but 333Palace offer a safe and secure banking environment to their customers. They also offer a lot of choices when it comes to deposits and withdrawals. Keeping with the global standards, the personal banking information are not shared with any third party vendors. Some of the payment gateways that they support are Visa, MasterCard, Skrill and Neteller among others. Depending on the payment gateway you choose, most deposits and withdrawals take anywhere from a few hours to two to three business days. Their number generators are also regularly audited, hence, helping the company be absolutely unbiased and transparent. 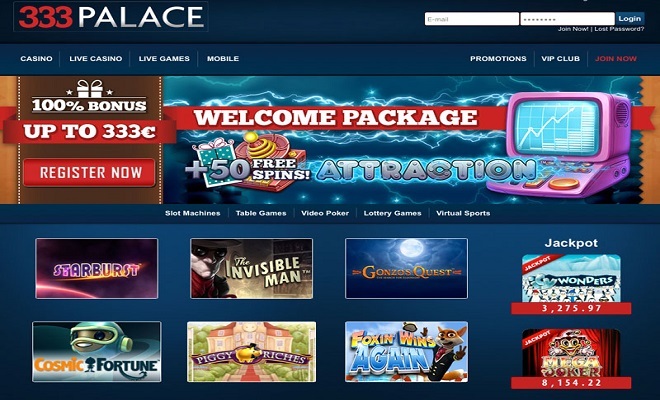 Overall, 333Palace casino is a charming place that lets you enjoy your games as well as helps you make some money!